To make things a little more fun here on Scrabble World, I've decided to start a weekly feature for word freaks to ponder about it... a challenge. No, I'm not 'challenging' any of your words... I'm challenging your brains. See if you can figure some of these Scrabble puzzles out. You can print this page or hand write the questions out to play at home (or wherever). Each week I will post a new 'Scrabble Challenge' on Friday, and in the new post I will have the answers for the previous week's puzzles. So, stay tuned for the results for this Scrabble Challenge next Friday! Now, see if you can figure some of these Scrabble puzzles out. Post your answers to the trivia questions (Puzzle 2) in the comments below, and let's see who gets them right! One of the biggest problems amateur Scrabble players have is realizing when they have a bingo. In other words, a seven letter word. An even bigger problem is when they actually spot the bingo, but have nowhere on the board to place it. In that case, they give up and settle for something less, not realizing that they could have ANOTHER seven-letter word that does fit on the board. Here are a few seven-letter words. Rearrange them to reveal another bingo. Click on the image to enlarge (or check out the typed words directly below the image). Puzzle 2: Do You Know Your Scrabble Trivia? 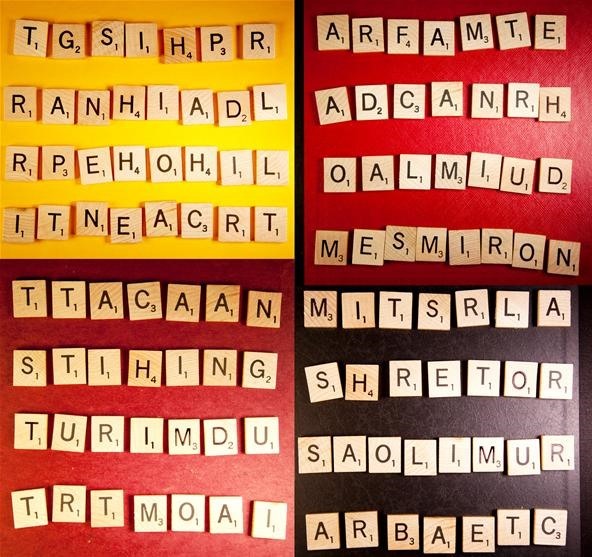 To solve these anagrams, you'll first have to beef up on your Scrabble history. Most of these trivia questions are easy, so you won't have to go far to find the answers. HINT: You can find all of the trivia answers here on this blog. We all know that Alfred Butts was the creator of Scrabble, but what is the only word that you can spell from his middle name, using all of the letters? And if you were to omit the last two letters of the city where Mr. Butts passed away, what's one of the longest words that you could spell? Remember who was the first company to mass produce the Scrabble board game? Now, take the seven-letter word in that company's name and rearrange the letters to spell a bingo. What do you get? What's one of the longest words you can spell from the current trademark owner of Scrabble in North America? And how about the highest value word from the trademark owners of Scrabble outside of North America? And I'm not talking about J.W. Spear & Sons. Most times, the bingos you play have common letter groupings at the beginning or end. What am I talking about? Well, there's prefixes like RE-, NON- and ANTI- that are common, as well as some obvious suffixes like -ING, -ER and -ED. But that's just the tip of the iceberg, and by no means should you limit yourself to boring old prefixes and suffixes. Memorizing these common beginnings and endings isn't hard, either—and hopefully this puzzle will help you catch on. Rearrange each combination of letters below to form a word that either begins or ends with one of the above letter groupings. Click on the image to enlarge (or check out the typed words directly below the image). Click here for the answers to all of the above puzzles. And keep up with Scrabble World: Like on Facebook and Follow on Twitter! Wow. Brain overload. Mattel is outside the U.S. so I'm guessing the longest word from that would be METAL.